The Fowler Sylvac Mark VI electronic indicator has a 2-1/4" diameter high-contrast LCD with 0-1”/0-25mm measuring range, four user-selectable resolutions of 0.00005", 0.0005", 0.001mm, and 0.01mm, a non-contact indicative measuring system, polyamide housing with a stainless steel shank and spindle, a 3/8" stem diameter, and a carbide contact point. The indicator performs inch/metric conversions, has a measuring speed of 1.5m/60" per second, and a repeatability of 2μm. The non-contact scale inductive measuring system has no moving parts and is insensitive to dust, dirt, oils, and electrical or magnetic interference. The polyamide housing is durable and impact-resistant. The indicator has a stainless steel shank and spindle, a 3/8" mounting stem, 4-48 UNF threading, and a lug back for a range of mounting options. The carbide contact point provides durability for surfaces with a hardness rating below that of carbide. The high-contrast LCD records minimum, maximum, and total indicator reading (TIR), has a hold feature that saves the reading for recording, and can be set to zero at any spindle location. Two measuring references can be individually preset to + or - 99.99999. Statistical Process Control (SPC) data collection and bidirectional RS-232C, USB, Digimatic, and wireless output capability transfers data to a computer (cable not included). When the indicator is used for SPC data collection, the zero button can be configured as a data I/O switch. The indicator requires a lithium wafer battery (included). Dial indicators are also called dial gauges, probe, and electronic indicators. These precision instruments measure small linear distances and object sizes. The dial magnifies the measurement so that it can be easily read by the human eye. Frequently used in manufacturing, laboratories, and other industrial or mechanical fields, dial indicators are used anywhere a small measurement must be found and recorded or transferred, such as checking the variation in tolerance of a workpiece. Standard dial indicators measure the displacement along the axis of the indicator. Dial test indicators are very similar to dial indicators, except that the axis of measurement is perpendicular to the axis of the indicator. Dial and dial test indicators can be analog, with a mechanical dial, or electronic, with a digital display. Some electronic models transfer the data electronically to a computer for recording and potential manipulation. 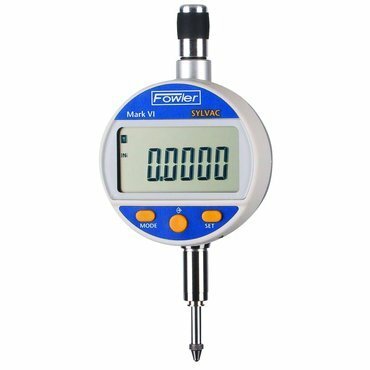 Fowler Precision, an American company, manufactures inspection and measurement instruments such as electronic indicators, calipers, bore gages, and digital scales. The company, founded in the USA in 1946, is headquartered in Newton, MA.